A Progressive, Open and Affirming Church with a heart for Jefferson City. (a) a small fertile or green area in a desert region, usually having a spring or well. (b) something serving as a refuge, relief, or pleasant change from what is usual. The Oasis United Church of Christ is a progressive, open and affirming Christian community. We are a church that is different. We are a church that is unashamedly United Church of Christ. We are a church that is committed to Radical Hospitality, living with Total Authenticity, Real Diversity and agenda-free relationships. The Oasis UCC is a place for the thinking heart – a place where people don’t need to leave their mind OR their heart at the door. In our common life as church we try to offer devotional, heart-centered worship that will fill your spiritual cup. The arts (music, dance, drama and visual arts) are centerpieces of transformative worship, and so engagement with the arts that is excellent, and devotional is a priority in the worship life of this church. We also seek to live out and embody our faith where people are challenged and encouraged to live out their faith in the communities of their daily lives. And we have an unashamedly progressive Christian theology where our calling as a spiritual community is to receive and embody Christ’s unconditional love in the world. We believe that we are called to live out our faith by sharing Christ’s love in the world in which we find ourselves. We are committed to sharing our time, talent and treasure in active mission. For 2018/2019, our focus will be on the United Church of Christ’s Three Great Loves mission campaign as we seek to live into who God calls us to be as a church. Serving our community with love, passion and care. Sharing our time, talent and treasure to make a difference in the lives of children and young people in our community and beyond. Caring for this world and all of creation with which we have been entrusted. We welcome visitors and would love to have you join us in worship on a Sunday morning. Our worship is devotional and heart-centered that will fill your spiritual cup. Join us for our weekly worship service as we worship God and grow in faith together. The Oasis United Church of Christ shared a post. This week's eCourier is here! The Oasis United Church of Christ shared a photo. 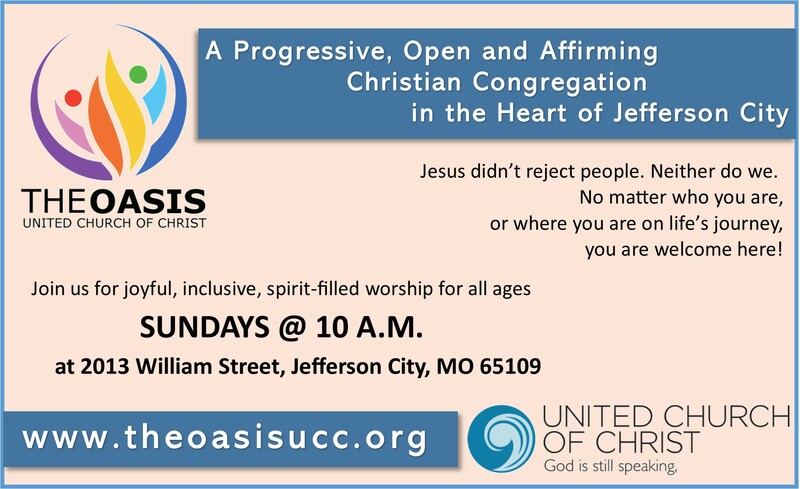 THE OASIS UNITED CHURCH OF CHRIST Living and embodying God’s love for all in the heart of Jefferson City, MO.